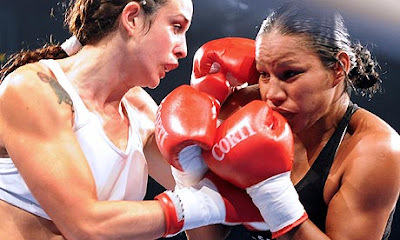 begin to dig: Athletic Bodies: which one is you(r desired shape)? Follow @mcphoo Tweet What do athlete's look like with their shirts off, and why should we care? When we're making body composition decisions like how much weight we want to lose, how muscular we want to get, looking at various sports body types may help us figure out what kind of training regime we need to get close to a particular shape. It may also be a bit of a surprise to find that, under the shirts, not all athletes have the physiques we might expect. 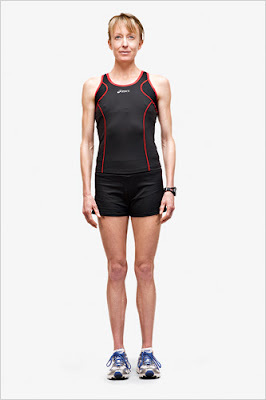 Some marathoners are more lean and muscular than tennis players. It's also interesting to see that there are similar body types for what might at first blush seem like very different sports. Eric Cobb of Z-Health uses this approach of pouring over images of athletic bodies to chat with clients about their own physique goals. So this post is a mini version of that book concept. From these images, it's then interesting to see what the training needs may be to achieve the desired type of physique. Now we might be tempted to say that a 6 foot bean pole is not likely to become a muscular adonis, but why not? As folks like John Berardi have demonstrated repeatedly with clients following his Scrawny to Brawny program (US || UK) , we all pretty much have the capacity to gain muscle mass. We need to work for it, and we need to eat for it. Similarly some might say, well a mesomorphic body type is not going to look like a marathoner because they're not lithe body types to begin with. Hmm. 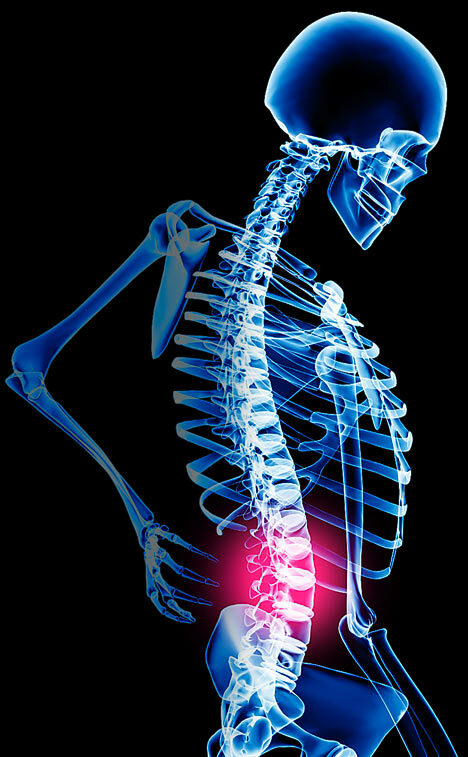 While fundamental bone structure won't change, it may still be reasonable to say ok, let's train for that kind of lean, aerobic efficiency. Bruce Jenner, olympic decathlete, gold medalist, world record holder and ex-football player, was a pretty good runner. It seems that there is a difference, when talking body comp, between training to be an elite athlete in a particular sport, and training to achieve the general dimensions of a particular physique. 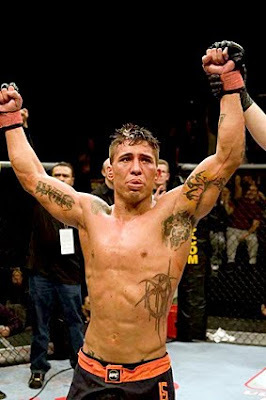 Lean muscular looks like this, seen in this athletic endeavor; more massy muscular looks like this, seen in that athletic endeavor, and sometimes, non-muscular looking looks like this in these athletic endeavors. Don't you think? Part of the surprise of athletes under their shirts may seem pretty ordinary looking at first glance. 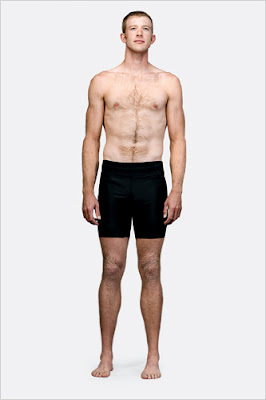 There's a fabulous new york times magazine slide show i found while looking for the following examples that shows olympic athletes, and their measurements against body types. Well worth looking at what 8% body fat looks like on a gal compared (deena kastor, marathoner) with 8% on a guy (brett newlin, rower). Note, i've also heard some people claim that the bf% posted on this page are "way off." To the best of my knowledge, they're not: they resonate with the chart at the end of this article, and with experience working with some athletes in these domains. 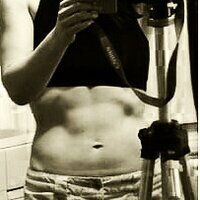 (Remember for a guy to see a 6 pack, he has to be below 10%. By way of contrast, most sumo wrestlers are about 25% bf and male shot putters 15). Here's a few more examples of elite, world champion athletes in a few other disciplines. As such they are largely represenative of the body types in their sport at this level. There are several examples that have several examples of such types to help make that case: gymnasts, cyclists, tennis players, boxers, etc. Clicking on the photo will usually pull up a larger image. Roger Federer (currently seeded third) is reputed to be the best tennis player ever. He moves remarkably across a court, getting shots that stun people. This is R.Federer with his shirt off during a practice set. Here's also the man who drove out about the longest match in wimbelton history with Federer this past June, Andy Roddick. 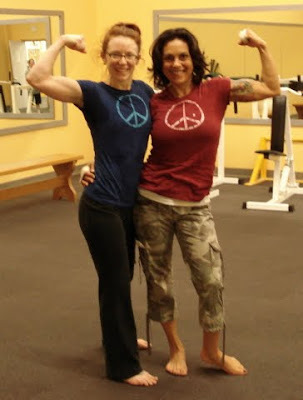 Very similar physiques, no? Tennis is a lot of stopping and starting, fast. An intriguing mix of endurance, speed and power. The main contrast it seems is Rafael Nadal (currently world no. 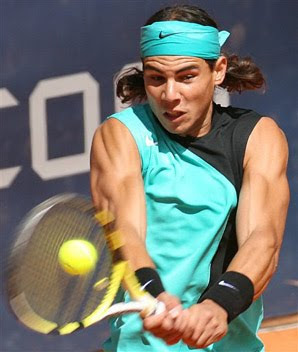 1)- amazing arms it seems on the court, no? But with the shirt off, the midsection resembles the other top seed men's players. And then there's world 2011 no. 5 seed Jo-Wilfried Tsonga. As examples of two other pro sports, baseball and basketball Derek Jeter and Chris Paul, along with top pro footballer, Wayne Rooney, and then one of Georgia Tech 09's football team crews and even more relaxed Denver Broncos team members, 08. 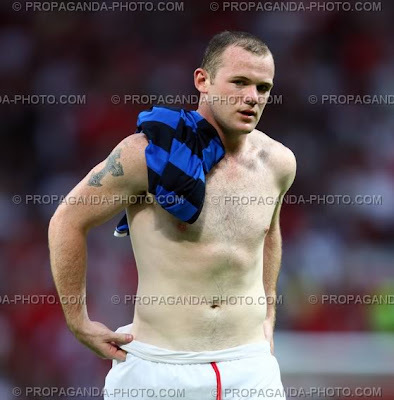 There's a site dedicated to snaps of footballers shirtless, so i'll leave this at that. For another sport physicque type, here's olympic swimmers, the incomparable Dara Tores (2 photos to see that sometimes the photoshoot shot is not that far from the more natural) natalie coughlin standing, michael phelps going for a stroll, and Usain Bolt post a very fast 100m stroll. We can see that as the efforts start to become more anaerobic/shorter than three minutes, the physique starts to change into something more muscular. Andrei Rybakou and Ivan Stoitsov are olympic lifters. Craig McClean and Chris Hoy are olympic track cyclists. Here's some notes on Hoy's (squat) training. It's worth taking a look at the legs of the silver and bronze olympic cyclists next to Hoy. Sometimes size matters, it seems - or makes a difference. On the field, Yelena Isinbayeva, pole vaulter, reflects a form that has to be light, powerful, flexible and fast. Last year's Women's Ethiopian Olympic Marathon team show a surprisingly similar type of physique, except that the pole vaulters shoulders, quads and abs are all slightly more hypertrophied, which makes sense. 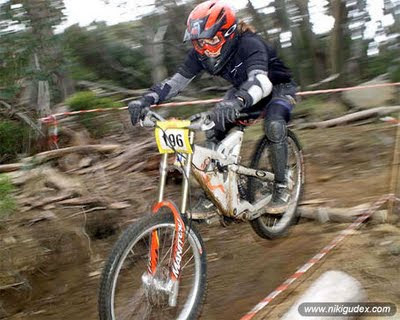 Similar to the French Women's Footballers are yes M.Sharapova and interestingly, another endurance athlete Niki Gudex (bike shown under niki's photo). Then consider the somewhat heavier (not fatter) half pipe champion snow boarder Gretchen Bleiler. Yes there three are all well lit photos and i think Gudex is still a young teen here, but the point is pretty much the same, with or without the lighting. These particular athletes have more endurance oriented frames - which makes sense based on their sports - than power forms. That said, we can also consider the chestnut about build determining sport here, too, with serena williams, at work and at play - remarkably similar. So what happens when super powerful gams are combined with great skill, technique and espertise? If sharapova did more power work, might she beat one of the Williams' sisters again? Just a question. And until Usain Bolt started shattering world records, didn't people say he was too tall to be a sprinter? We see the progress towards greater hypertrophy in women, same as in men: the more anaerobic the event, as seen in this photo of 100m sprinter Torri Edwards, and olympic lifter Maryse Turcotte and Ruth Kasirye. Just look at how relaxed she is in that lift. Wow. for the women, we see a similar physique to the women's boxers: rosi sexton (phd in comp sci) and gina carano - relaxed and posing - and rosi sexton and debi purcell at a weigh in. 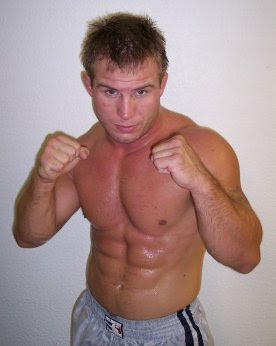 for the men - Jan Koppenhaver, pre and post fight; former UFC champ, Sean Sherk, fighting trim, and not quite so. 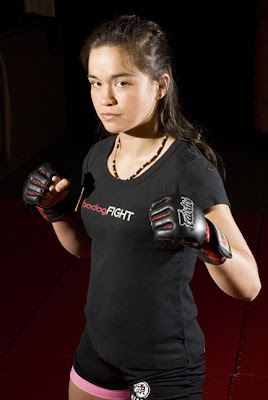 Here, we know fighters are kinda the complement to tennis players where we began. They do need endurance and excellent V02max capacity. They also need to be able to generate force rapidly and maintain holds - all while staying sharp. Until, as with power lifting, it seems we get into the heavier classes of fighter or lifter/strongman, where girth tends to overwhelm the muscularity, though not the flexibility of the athlete, where girth creates an advantage for the athlete. 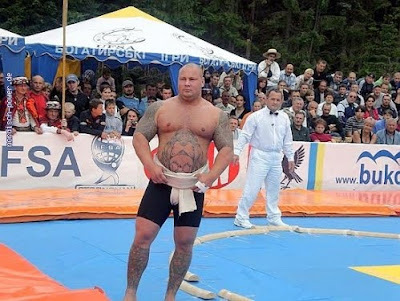 Examples here are strongman champions Travis Ortmayer and Tobias Ide. 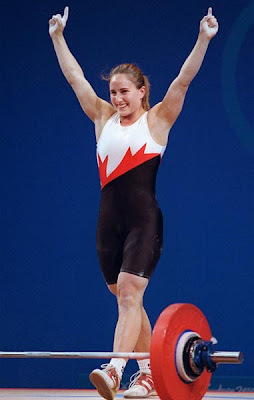 We don't start to get into the even more chiseled/sculpted physique - in either men or women - until we move away from sport sport and into the *specific* act of body building such as Laura Phelps: gymnast/soccer player turned bodybuilder turned power lifter (amazing story). THen lest one think that heavy class guys have to be less defined to stay strong in their sport, their is the steady transformation of powerlifter Dave Tate (working with John Berardi Precision Nutrition). And just before leaving, what athletic spread would be complete without a few KB/powerlifting athletes: Fawn Friday and Pavel Tsatsouline both use KB's and powerlift. Tracy Reifkind is pretty much a KB exclusive lifter, and Yoana Teran Snideman goes after KB's and Ropes. What these photos suggest is that an Atheletic Body in balance for its sport is a mean lean efficient machine, but not always, necessarily, the expected physique naked. Our sometimes-penchant for Arnold type muscle mass and balance is intriguingly at odds, it seems, with the bodies produced by functional performance. 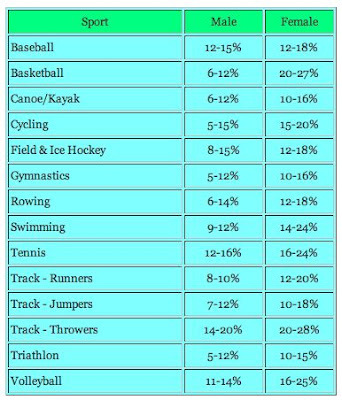 The following table details the percentage body fat for male and female athletes for a variety of sports. I'm not sure the sources for these percentages, but this is usually a pretty good site, and may help begin to ballpark body comp goals. So an application of a picture essay like this may suggest is that if we see a body shape we like, we can match it against the training regimen of that kind of athlete, and see if that kind of training regimen is the one for us. best intro to KB's and best beginner and ongoing training: review of Enter the Kettlebell. You forgot the great champs of competitive eating. I joke but, Kobayashi actually does a specific weight training program to help him improve as an eater. Its pretty cool. I think your observation is a great one. I'd add that perhaps our expectation of what an athlete should look like may influence our collective perspective on how an athlete should train too? Perhaps many an athlete and many a coach is influenced to train for body composition because of this influence, even at the detriment to the success of the training. Roland, i've been thinking about the inverse: 300 lb 5.9 squatters - women. guys who are likewise obese to pull really heavy weight. how is that "athletic"? mortality rates of sumo wrestlers have been higher within all age ranges in japan . Their training nutrition leaves them more likely to have liver disease, despite the fact that they're at a 20% bf - during their careers. Mind you what was that study awhile ago where olympic athletes were asked, if you could take a pill that guaranteed you gold, it wouldn't be detected, but you'd die the next day, would you take it? and the majority said "yes"? Shows the athletic body types side by side.